I love spicy food. So, when I saw an Insta post about Restaurant De Hunan I knew I had to try it. After further Google-ing, I spotted more deliciously spicy looking dishes from De Hunan, and now I can’t wait to give it a try! De Hunan has several branches around Klang Valley – original one in Kuchai Lama, Bandar Puteri Puchong, Kepong, Nova Saujana & a new branch in Cheras Selatan (not in pic). Decided to go for the original Kuchai Lama branch. It was the closest to all my family members. Plus, I mean, they have to have all the dishes PERFECTED in their original branch, right? It was an interesting call when I made the reservation. The lady on the phone didn’t speak English. So I had to muster the little Mandarin I know so I could book the table. I punched in the location on Waze and it directed me here easily. It’s a corner lot in a shoplot part of Kuchai that I wasn’t too familiar with. Nestled in the edge of the lot, corner shop among what I would now call “Little China”. There were quite a number of Chinese cuisine restaurants around here. From Szechuan restaurants, to Hotpot and Crab places, to Chinese mini markets; it was like an interesting corner we ventured into. Came on a Saturday afternoon for lunch, and the place was luckily not too busy, even though I called to make a reservation ahead of time. I was expecting to make my order in Mandarin again, but thankfully the waitress who took our order could speak Mandarin AND Cantonese, so my family could order easily. She was also very helpful recommending dishes to us, which includes young children, and advise on portions. There were 2 clear winners, among the dishes we ordered, in my opinion. The Sizzling Spicy Frog and the Salted Egg Tofu. Both are dishes I can happily order again and again, and eat everyday. It was that good! If not for kids among my lunch party, we would’ve ordered a lot more spicy food. 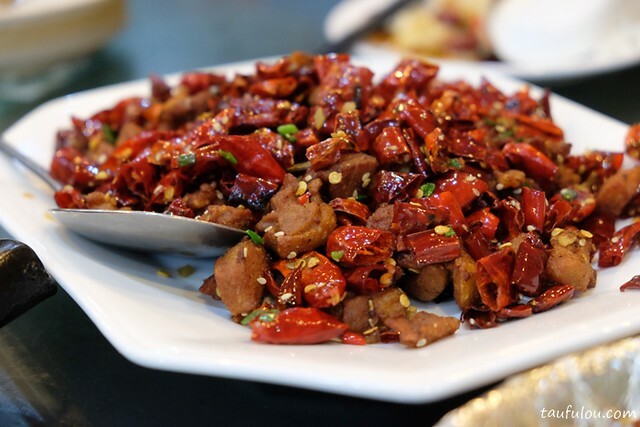 There were a few dried chilli spicy dishes that I made a mental note to come back again with my girlfriends to try. For a Chinese restaurant like this, the food wasn’t too cheap really. The meal came up to ~RM355 for a party of 7 adults and 3 children, including some soft drinks, Chinese tea and white rice all around. Nevertheless, food was satisfyingly good for my spicy palate, that I vouch to come back here again, for sure. If I could, I’d probably make this my regular joint. Including bringing different friends and family here to sample more dishes on their menu. So, who wants to come makan with me? De Hunan also recently branched out with a new outlet serving my favourite hotpot cuisine. The outlet is located near me at Desa Sri Hartamas, and I received a RM50 voucher after our lunch, to give it a try. I mean, look at that! I MUST try it, right? Jom? Add: No. 2, Jalan Kuchai Maju 6, Off Jalan Kuchai Lama, 58200 Kuala Lumpur, Malaysia.